As a foreign student living in Korea, I have received a lot of this. What is this, you ask? 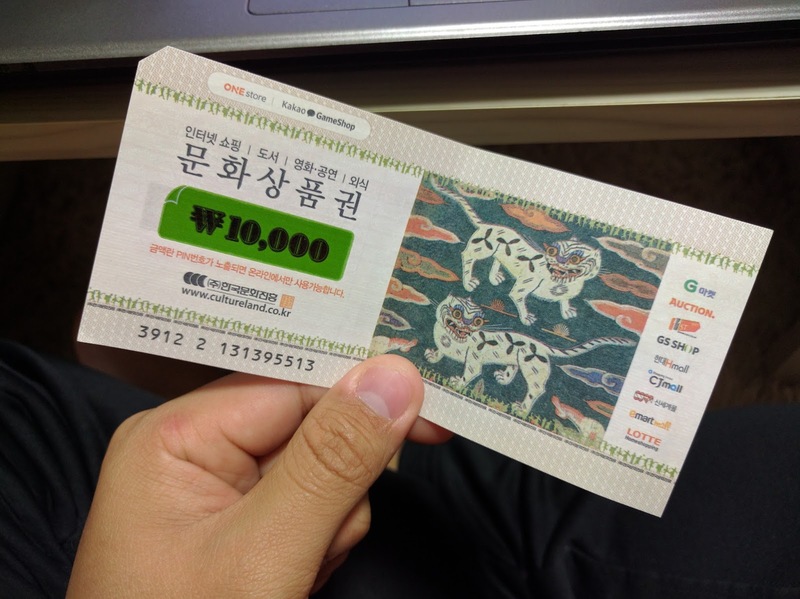 This is what Koreans like to give (in general) as prizes in place of cash. So the very first time I received this, I had no idea where to use this or how to use this. I thought that bringing it to any of the places listed there I could use the voucher however I was told again and again that I had to use it from their website. I did not even know where the code was located neither did I know how. Then I did some extensive search and finally found out how to use. 한국인이든 외국인이든 컬쳐랜드 문화상품권 받으신 적이 있을 거에요. 꼭! 내가 처음으로 받았을 때는 한국 온지 얼마 안 됐고 어떻게 쓰는지는 몰랐죠. 상품권에 적힌 회사들에서 쓸 수 있는 줄 알아서 이마트에 가져갔는데 안 된다니까 못 썼어요. 검색해봤으니 결국에 어떻게 쓰는지도 알고 코드 어딘지도 알게 됐어요. 오늘은 사용법을 알려드릴께요. Firstly, you see that green area with the amount? THAT'S where you're supposed to be scratching for the code. 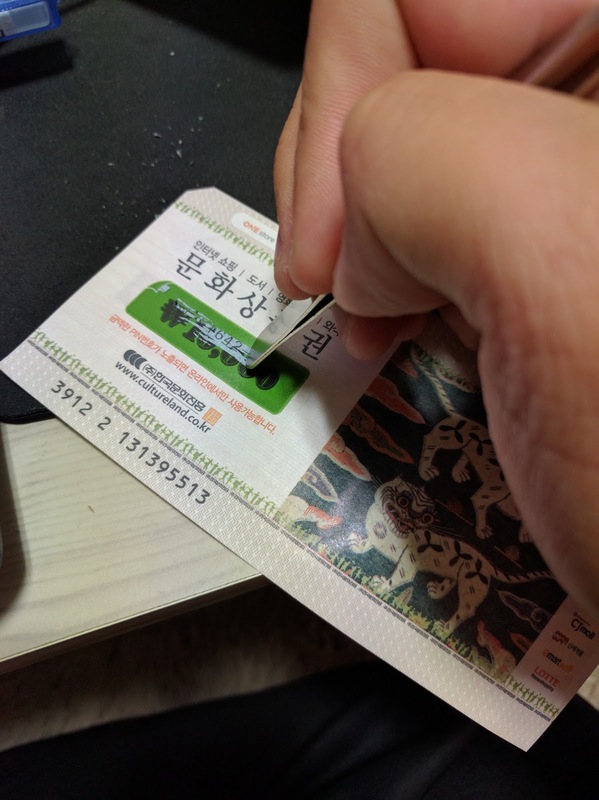 I searched high and low and tried keying in every single number on that piece of paper long enough till I accidentally scratched it with my finger to find out that the code was located there. 사진에 따라서 코드를 찾고 컬쳐랜드 웹사이트 들어가고 로그인하세요. This is what you'll see. On the top right hand corner, you see a login bar. First you have to create an account and then you can login. Once you're logged in, you'll see the image below. You need to click the button for "recharge" or 충전하기 where it brings you to the page where you can type in the code. Once there, you'll type in the codes in the spaces below before clicking the button to confirm. Once done, the money will be in your balance which you can use to purchase anything from any of the websites supported. 그후에는 충전하기 크릭하고 빈간에서 코드를 입력하세요. 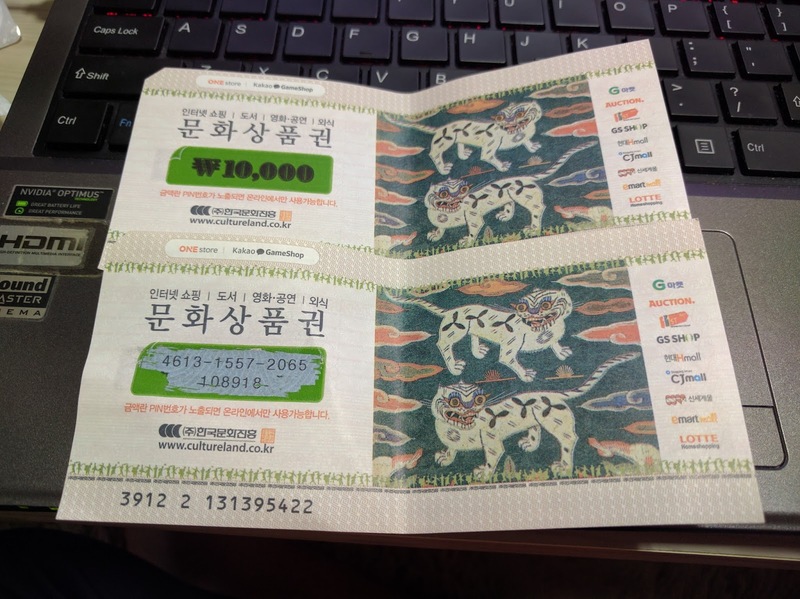 컬쳐랜드 문화상품권을 쓰기는 엄청 불편하고 복잡한데 결국 썼으니까 괜찮았어요. 오프라인 쓰기는 잘 모르겠는데 온라인 쓰면 컬쳐랜드 웹사이트 텅해서 지마켓이나 딴 사이트에서 구매하셔야 돼요. 하지 않으신다면 결제하실 때는 컬쳐랜드 상품권 금액을 사용이 불가에요. Now, you can check out all the brands that are available to you for use with this voucher. There are online and offline platforms as well. I'm not too sure how to offline platforms would work since it's an online form of charging into your account. But I guess you can head to those places to check it out as well. For those that are online, you need to access the websites THROUGH cultureland, or else it wouldn't have the option to pay via cultureland cash. That's all! I hope the post helped. I did all the steps shown but I still didnt manage to buy a single thing from thos websites. I couldnt see options for paying with the coupon. Any tips? Hey! You have to access the website FROM the culture land website to be able to buy something. If you went to those websites independently then you wouldn't have the option to pay with the coupon. Good luck! Online shopping is rapidly becoming the first choice of people in the world for modernized or traditional shopping Vienna Imports.